College Football Doesn't Need a Playoff ~ The Bucky Channel - The World of Sports from Wisconsin's Perspective. What was your first reaction when you read the title to this posting? I am willing to bet there wasn't a single one of you that read that and went, "You know what, he's right." Good. Clearly, college football needs a playoff. I was just testing you. I don't even know if I'm going to get a logical sounding post out here, I'm just so upset at how flawed this system is. You're telling me after yesterday that USC isn't the best team in the country? Okay, maybe you're not ready to go that far. But still, you can't seriously tell me that they shouldn't be considered as such. 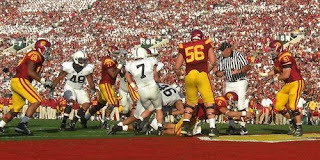 I mean, the Trojans just embarrassed Penn State on Thursday. Sure it was close at first, but that whole game was a joke. Between USC not getting a chance to play for the national title and the whole "Oklahoma is better than Texas even though TEXAS BEAT THEM" argument, college football is really showing just how stupid it is. I'm not even enjoying watching these bowl games. Even though there have been some good games, I watch these games under a fury of rage at how stupid the "postseason" format is. For example, I just watched Ole Miss beat Texas Tech, the number seven team in the country. Congrats to them, but that's it? Their season is over because they beat the number seven team in the nation? Whoopitydingdong. Let them play another game! Utah and and Alabama play in just a few hours, and the winner of that game plays... not til August? How does that even make sense? Utah could finish the season with a 13-0 record including a win against Alabama and not even be considered as the national champions? Does anyone else see a flaw in this? Someone please try to tell me how the bowl system is still the right thing for college football to do without using the word "tradition". I'm so sick of that word. You're telling me we should still have a Rose Bowl because 100 years ago that's what they did? It's so unfathomably stupid why anyone would be against a college football playoff system. They do it in the lower levels of college football, why can't they do it in the FBS, or whatever they call Division I these days. Bonus points if you can also write your argument without using the word money, because I guarantee you college football would make more of it with a playoff. Have you seen how much money the NCAA makes off March Madness? It's so simple. Do a 16 or 24 team playoff, incorporate your stupid Sugar and Rose Bowls however you'd like. Then, if you really want to watch college football on some Tuesday night in mid-December, let some of the teams that missed the playoffs play in an NIT-style tournament or have them play in single bowl games for the hell of it. Cha-ching. But even though I hate it, you can bet I'll be watching Utah/Alabama tonight. Stupid college football. Utah took an early 14-0 over Bama. I can't express to you through words how mad I am this season about no college football playoff. It doesn't make sense and it is driving me crazy. Are you even surprised that Utah smoked the team that was supposed to "dismantle" them? So now between, Utah, USC, Florida, Texas and Oklahoma we're supposed to be content with what Myles Brand and the NCAA is serving us? What a joke. I'm with you that I don't even enjoy watching the games. Is there any question, ANY AT ALL, that the championship game will be a huge rout? Thus opening the door for USC/Utah/Texas (like Ohio State has a prayer) to claim THEY should have in the title tilt? I just hate how Utah fans, god bless their soul, are holding up signs tonight that say 13-0. You mean to tell me this team just won 13 games and had ZERO LOSSES with a finale win over Bama, and they are content with being #3-5 in the country? How are they not more outraged?